Good grief I've eaten more tender beef and gourmet cheese than any one girl should. Not to mention the case of red wine I probably consumed singlehandedly. In other words, I had a great holiday! But after all the fun, I need a nap and some serious vegetables. I alway find soup's a good solution when you're wanting to go healthy, but aren't necessarily in the mood to chomp on a salad. 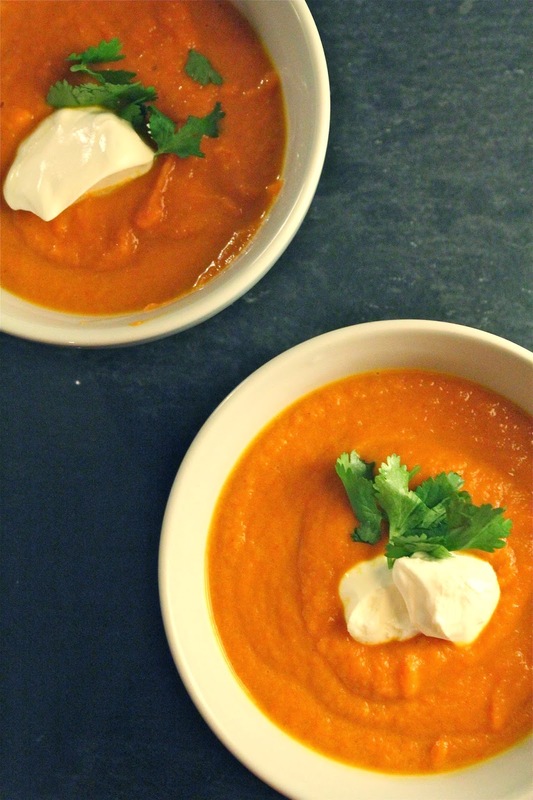 This carrot soup delivers on the fresh factor and its flavors are anything but Christmas-y. Nothing like ginger and curry to cleanse the holiday palette! Heat olive oil in a dutch oven over medium heat. Add shallot and saute until softened. Add ginger and continue cooking for another 2-3 minutes. Add carrots, salt, turmeric, curry powder and saffron and cook until fragrant; about 1 minute. Add chicken stock at bring to a boil. Reduce to a simmer and cook until carrots are softened; about 20 minutes. Use an immersion blender to puree soup. Serve with cilantro and yogurt. Enjoy!